For the person entering the heinous world of a mood episode, the severity may not be as easy to ascertain. The confusing gauges, like a compass not calibrated for true north, don't always define how manic you are. In my experience, the depression is much easier to spot and prepare to combat. Symptoms such as increased speech patterns or racing thoughts, can be unpleasant and your mind can flip flop between them. For me this usually increases where pacing the floor or becoming extremely quiet and withdrawn occurs. At this point, my survival manual tells me I am in the middle of a mental illness storm. My sleep is usually effected by the sped up activity in the mind. A manic episode is likened to drinking 10 cups of coffee before bed time. Immobilization or muscle rigidity can set in which makes sleep impossible. My body takes on a heat much like a woman's hot flash and radiates over my entire body. Persons who cannot recede from clinical levels of mania are, more often than not, hospitalized. When I am in an episodic cycle from mania, depression or both, I often pray. It is not a magic cure and sometimes I feel a sense of guilt. If I am depressed at a level five or more, the hopeless feeling already resembles guilt. So, pray on! I know all persons in survival mode ask, "will I get off this mountain alive, live through this scorching desert, or find the correct route to safety?" Survival trainers preach, "don't panic"...it's a death sentence! In the case of my episodes, anxiety is always a concern and is a close brother or sister to mania. It is only a matter of how anxious you will become. So, I go to my man-cave, where the bed is comfortable and secure. I uncover just as if my body is in a fever. Especially in the winter time, like January, the cold air shocks my system. I also engage in deep breathing techniques, taking long sips of air through my nose and slowly exhaling through my mouth. Survival professionals will tell you of the grueling discipline one needs to surmount the odds. The same applies to a mental health episode. It is gut-wrenching to exercise deep breathing when it feels like a bull dozer is sitting on my chest. I managed to eek out five deep breath in a recent episode where the hopelessness of my soul was crying all around me. The cold sunken sensation in my body was revolting. I did notice the depressive contractions grew further apart. There are some episodes where I can determine the longevity by the diminishing mania or depression. I use a journal to chart and a mental gauge to calibrate the severity of my episode. Just like a survivor, I am always aware of my progress and looking to maximize the process. After 30+ years, I am pretty accurate with determining how long it will be until the episode completes its cycle. I am always relieved...that's an understatement...to realize I have survived another one! Some but not all reach the point of extraction. Many a woodsman, hiker, kayaker, mountain climber died trying to LIVE! Those who do survive, depending on their condition, may need medical attention or hospitalization. I am left tired, lacking drive and focus and require more rest and sleep. 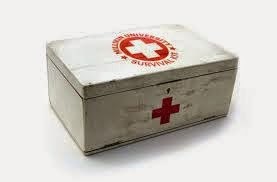 A therapeutic tool for renewal in my survival kit, is to write about my experiences. I also keep strict notes in my self published "Moods, Meds & Meanderings", mental health journal. I am always grateful to God, my family and my survival kit as I exit the death trap of another mental illness episode.